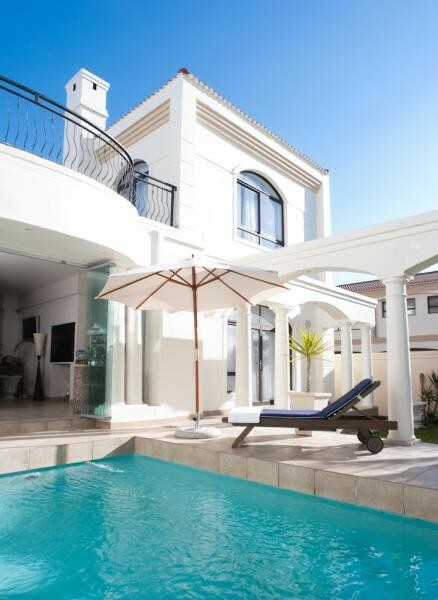 Within close vicinity you can reach all numerous attractions Cape Town and its surroundings have to offer. Our guesthouse's exclusive setting is the ideal starting point to explore the magnificent Cape area and will turn your stay with us into an unforgettable experience. After an exhausting day of sightseeing or a strenuous business meeting just arrive back in the privacy of our homely estate and enjoy a glass of the world famous Cape-wine, relax in the pool area or let your mind get lost in the marvellous sight of the sun setting at the beach. Watch the Giants of the Sea - every year between August and December, a large number of whales will be found offshore bearing their calves. Don't forget your camera! And if you feel like getting sporty: the ALLSTAR VILLA is situated in the middle of the popular Milnerton Golf Club and the fantastic Atlantic Beach Golf Course - both to be found directly on the beach, offering challenging games and spectacular views of Table Mountain. Our multilingual management will gladly arrange tee times as to your demands.